Customer service is a lost art,” says Mark Zeitlin, owner of Zeitlin Optik, a high-end optical boutique in the heart of Midtown Manhattan. In a world where often times customers feel more like nuisances or dollar signs to sales representatives than people, one must admit that Zeitlin’s observation is right on the money. “That’s why I don’t allow cell phones on the sales floor. And no one here ever turns their back on a customer for any reason. It’s just rude and I don’t think a lot of people realize it.” Within minutes of speaking with Zeitlin, it’s clear his old school approach to customer service is what led his business to become not only a successful retail endeavor, but also a staple in the Midtown East neighborhood of New York all of which is exactly what Zeitlin set out to do when he opened over 23 years ago. LOCATION 40 East 52nd St.
Zeitlin’s client base is a true mosaic—from lawyers and business people to celebrities and heads of state, including the King of Morocco. They come from all over the world or from across the street. And if his clients can’t come to him, Zeitlin will go to them. He has been known to make house calls for his elderly patients who are no longer as mobile as they used to be or for celebrities or politicians who may be unable to be seen openly in public. But, however extensive and varied his client base may be, there are two very important qualities that define a Zeitlin Optik customer: 1. An appreciation for a finely crafted, handmade pair of glasses with an impeccable fit and 2. a sense of humor. “If you’re going to be a client here, you have to put up with my bad jokes,” Zeitlin says with a smile. These days, Zeitlin has a lot to smile about. Recently, he was struck with a severe illness, but says his relationship with his clients, their care and compassion brought him back to good health. While he was ill, Zeitlin continued to work and he firmly believes that if he had stayed away from his store and his beloved clients, he may not have been with us today. While he was ill, his clients visited constantly to see how he was holding up. There were candles lit for him in the Catholic churches and prayers being said in synagogues and mosques. People dropped off care packages regularly or would quickly peek in to see if he needed anything. In fact, while we chatted, a regular client stopped by to drop off a card. “You know I’m so happy to see you,” she said lovingly as she slipped out the door. His close relationships with his clients, many of whom become dear friends, sometimes transcend beyond the workplace. While battling his illness, in and out of the hospital, Zeitlin’s loyal friend and client, famed crime writer Dominick Dunne, would call Zeitlin with the inside scoop on Hollywood crime stories. These calls helped take Zeitlin’s mind off his illness and the two grew ever closer through the experience. In a sad turn of events, as Zeitlin steadily improved, Dunne fell ill with a similar condition, and unfortunately, lost his battle only a few days prior to our meeting. He spoke of Dunne with great respect and affection and it was apparent that Dunne’s friendship had a deep impact on Zeitlin’s recovery. It is this mutual care and concern that has enabled his business to prosper. He has never set out to make a one time sale. His goal has and always will be to establish long term relationships simply by treating people the way he would want to be treated. 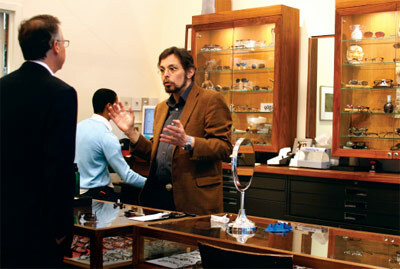 For this reason, every detail of a client’s experience at Zeitlin Optik is crucial to Zeitlin. Each and every pair of lenses are precisely measured and produced on site. Each staff member uses the same measuring process in order to ensure consistency. Zeitlin insists that all his staff members take the extra time to do each and every measurement correctly. As a result, his success rate on progressive lenses is, he says, basically 100 percent and has never had a non-adapt for as long as he can remember. Zeitlin Optik offers a luxurious, modern and well-edited collection of frames featuring styles from Gold & Wood, S.A.L.T. and Sama. Zeitlin and his staff also create custom frames for some of his clients. Zeitlin’s devotion to his craft and his customers has now been handed down to the next generation. His daughter recently made the decision to join her father’s side in business and carry on the Zeitlin Optik tradition of excellence. Zeitlin is excited that his daughter will share the same joys he’s experienced throughout his time at Zeitlin Optik.